Add to your security system or just connect it to your TV for a beginners monitoring station. 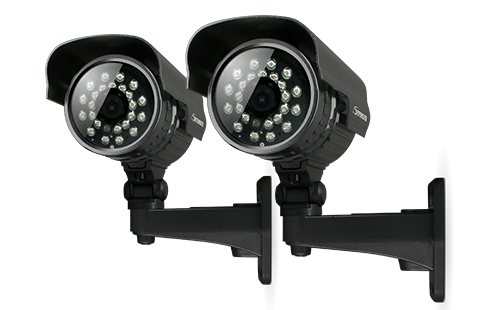 The SP301-C is a high resolution CCD color camera that can be used indoors or outdoors. At 420 TV lines of resolution, you will see a clear, consistent picture. The camera is a simple and effective addition to any existing security system, and gives you an extra eye when protecting your property. Now you will always be aware of what happens at your business or home with 12 infrared (IR) LEDs that allow you to see in the dark, up to 15ft away. Mounting the camera is easy due to its compact size and 60ft of included wiring—you can set it up almost anywhere! View in the Dark with Automatic Night Vision The SP301-C comes equipped with 12 infrared LEDs that allow you to see any monitored area (up to 15ft away) in total darkness. Night vision activates automatically when it becomes dark and deactivates during the day to save energy with a CDS sensor. You will always be able to see what is happening in your yard or at your business after-hours. Clear and Crisp Picture The high quality CCD image sensor in this camera provides a clear, crisp and consistent picture at 420 TV lines of resolution. This also allows you to better distinguish facial features, which can help in the positive identification of individuals. Weather Resistant Aluminum Housing This camera is built for the outdoors with professional grade anodized aluminum and a sunshade that helps protect against rust, deterioration and glare. Easily Connect to TVs and DVRs You can connect the camera to your television, monitor or recording equipment in minutes. Since there is only one wire to connect, setting up live viewing is simple and hassle-free. Convenient 24/7 Lifetime Live Customer Support Assistance is available for you whenever you need it. Simply visit www.Defender-usa.com for simple tips on how to protect your property and instructional videos on topics such as camera placement. Our customer support team can be reached by phone 24/7, or by email and live web chat services so that you will always have access to an expert. Endless Mounting Options The SP301-C comes equipped with an adjustable bracket, so that you can mount the camera on a ceiling, wall, or desk effortlessly. You also have a lot of flexibility with the setup of your camera with 60ft of included wiring.